The Donna City Commission joined an international business owner Tuesday evening for a groundbreaking ceremony marking the construction of a duty-free store near the Donna-Rio Bravo International Bridge. Travelers leaving the country who purchase products — such as liquor, tobacco, perfumes, colognes and jewelry — at duty-free stores located at ports of entry do not have to pay certain taxes on the products, making it more affordable for those departing the U.S. for Mexico. UETA will be the second business operating at the bridge when construction on the 2,840-square-foot building is completed by the end of this year. Currently, a money exchange is the sole business near Donna’s bridge, where most of the nearby land remains undeveloped. Attracting business to the area has been in the works for city administration, commissioners and the mayor, who await commercial traffic to eventually cross north and southbound at the bridge. Construction on the commercial southbound lanes has been delayed until about April. 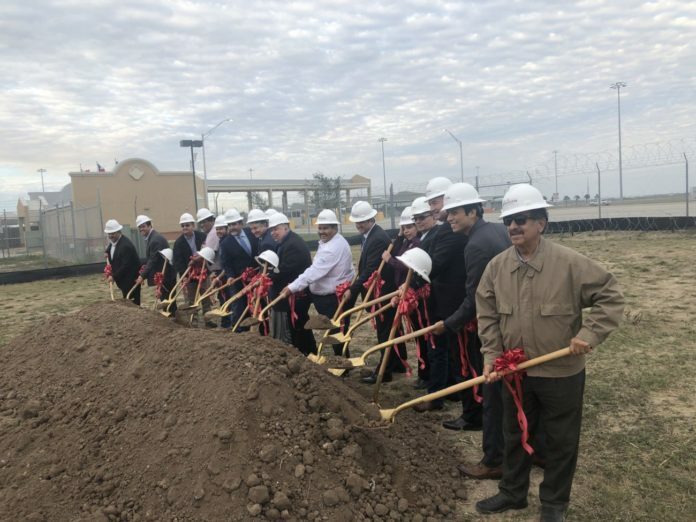 “We’re ready to start (construction),” said Donna Commissioner Oscar Gonzales. To develop land surrounding the bridge, the city in August purchased the land where UETA will be built from Donna Irrigation District No. 1, according to bridge director Jesus “Rene” Reyna. It will lease the land to UETA for 20 years at $48,000 a year. UETA operates duty-free stores at bridges throughout the country, including in Hidalgo, Pharr, Progreso and Brownsville. In December, the passenger vehicles crossed 56,000 times through the Donna-Rio Bravo International Bridge, a record high, according to Reyna. Mayor Morales said other business developments along the bridge are also expected to be finalized his year.